The hubs has been working hard on making our backyard usable again. Which is necessary on account that the BDD pushes my blinds out of her way to look out the window which then not only shortens the life expectancy of said blinds but chips the paint off the window’s trim. No amount of shooing can keep her from doing it either. So you see, the hubs’ hard work will pay off once I can just let the beasts free in the backyard again. And since he’s been hard at work, so have I. I’ve put in hours with him pulling nails, getting rid of trash and what not. But this past weekend, I did the biggest favor of all. I mowed the grass. This might not seem like a big deal, but to me it is. I’ve never mowed the grass. The men in my life have always done the mowing so there’s been no need to. 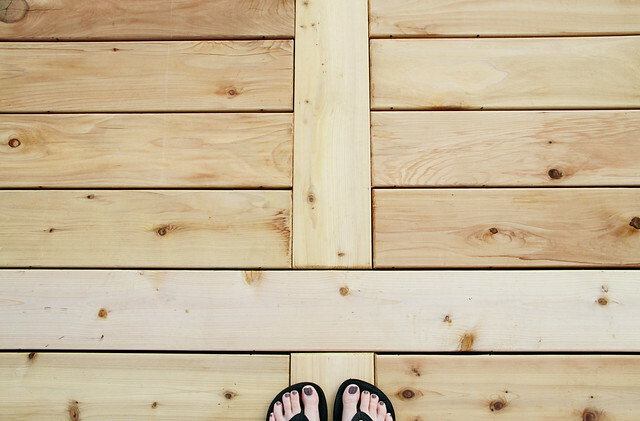 But if I wanted to take that picture up there, with my feet standing on a new cedar deck floor, I was going to have to mow. And since the hubs was fine letting me near the pushing mower (I might have lowered the deck on a riding mower once resulting in a fresh, curvy go-cart track through a yard. Maybe. It could be myth. ), I put in my husband blockers and I went to work. Husband blockers = Skullcandy earbuds. Believe me, you can’t hear them calling your name at all. It’s pretty fantabulous. How hard could it be? It’s like vacuuming the yard, right? WRONG. It’s nothing like vacuuming. It can’t be done one handed. It’s so easy to leave a small strip of tall grass. It’s impossible to guide that machine over to that small strip to clip it. I did what any smart person would do: I started behind the garage where no one could see me. After about 20 minutes, I started getting the hang of it. But it’s definitely not like vacuuming. I walked away with a sunburn (how I manage to miss sunscreening body parts, I’ll never know) and a nice-sized blister on my thumb. Trying to explain to the hubs that I have delicate lady hands was wasted breath. But after spending so much time outside, there in the open yard, I had another concern. When I work outside, I like listen to music. Thus, the husband blockers. It makes the time go by faster and I’m not as bored with the physical labor as I would be otherwise and I don’t have to overhear any conversations that may include my name or hissing. I sing along quite often but I have perfected my earbuds-in singing voice as I usually do this at my desk at work. I have no worries about that. My random bust-a-move dancing, however, has not been perfected. I skip through the yard, snapping my fingers to Madonna. I do my own rendition of Rhythm Nation from the shed to the house. I shake it like a Polaroid picture behind the mower thanks to OutKast. I’m a one-woman show, dancing for 15 seconds at a time, parading to a tune that cannot be heard by anyone else. I thought nothing of it until I locked eyes with a neighbor. Who was watching me. And so now I’m concerned they think I’ve lost my marbles. Susan - Ha! Oh, that’s priceless. But I’ve witnessed your dance party moves, so I’m sure the neighbor was nothing but impressed. Also, I have never mowed the lawn, either, so I’m doubly impressed. Go, Brooke! cut grass. Even worse, girls should never ever bushhog a yard. Out backyard ended up like a jungle one year (the lawn mower broke and my ex was a lazy beepidy beep) and the only thing we could do was bushhog it. We being me. I cried the last half of the yard it was awful! Ps. That porch is beautiful! Wendi @ Bon Appetit Hon - I can just picture you busting a move while mowing. But I’m hoping you didn’t do the mowing in those flip flops. T’woud be a shame to sever one of the piggies…especially when they are painted in that lovely shade of Rimmel. Brooke - Oh no no no. I wore sneakers. Taking no chances to not have a piggy go to market or wee-wee-wee. I didn’t pull out the camera until the next day, when part of the floor was complete and oh-so-pretty. Becki D - I’m a bit jealous. I’ve been begging my Hubs to let me mow the lawn for as long as we’ve been married! He’s not so much a yardwork kinda guy and I hate pestering him to tame our yard. But he won’t teach me how to use the stupid machine….and I’m not quite confident enough to try to figure it out myself. Anamaris - LOL – I can see you getting your groove on. Worry not about the neighbors; they’ve found your marbles and are keeping them for some more entertainment.